Even with the rise of China as a global presence, the world remains enamoured with all things Japanese, be it anime, video games or crazy cat cafés. In the 80s – the era of peak Japan fascination – even kitsch movies like The Karate Kid captured the world’s imagination, with viewers enthralled by a scene in which the protagonist’s honed dexterity is displayed as he catches a fly with his chopsticks. 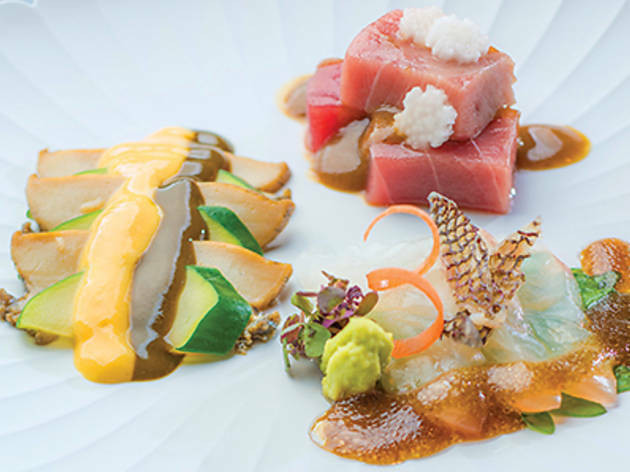 This Japanese spirit of perfection is exemplified in the country’s cuisine, and kaiseki in particular. Modern kaiseki refers to a seasonal multi-course meal, featuring labour-intensive preparations incorporating premium ingredients. It’s also renowned for being expensive. One restaurant that is a prime example of this cuisine is Kashiwaya, in Osaka. Almost four decades old, the eatery has been awarded three Michelin stars for the last five years, placing it amongst the best restaurants in the world. Luckily for us, in seeking to expand, Hong Kong has been selected as the site for Kashiwaya’s overseas outpost. In charge of the kitchen is Jun Takahashi, a man with more than 20 years’ experience at the Osaka original, who trained under Hideaki Matsuo, owner and head chef of the famous establishment. Conveniently located on On Lan Street, in the same building as Arcane and the Michelin-starred On Dining Kitchen, the main premises are small, with just a handful of tables facing a six-seat counter. Hidden from sight are three separate rooms that, we’re told, can cater for private parties. The décor mirrors its counterpart in Japan with sliding doors, paper screens and clean lines. True to kaiseki tradition are the prices. Serving only a seasonal set menu, the 10-course meal is an eye-watering $2,300 per person. Despite the stratospheric prices, we walk into a near full dining room on a Monday evening. The quality is apparent from the first course, with even the plates a cut above the norm. We’re informed the crockery is made by artisans with more than four centuries of history (think Wedgewood and add another hundred years) and the plate our amuse bouche is served on comes decorated with the image of a stork – a symbol of change referring to the migration of the restaurant to Hong Kong. The dish itself is a small mound of brine-boiled clams, soy marinated salmon roe and thinly sliced yuzu that perfectly balances the fresh, sweet seafood, the saltiness of the roe and the zesty bitterness of the fruit. Amazing. The next course arrives on a plate patterned with a symmetrical daisy, which looks a collector’s item. 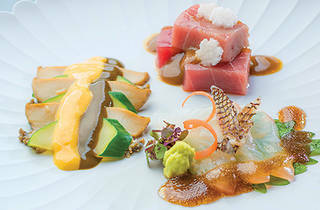 Resting on top are three types of sashimi – sea bream, abalone and tuna. As well as fresh wasabi, the fish are garnished with a Matsumae-style soy sauce – another esteemed ingredient. The sauce finishes with a kind of nuttiness we’ve never tasted before in such a common condiment. Crab follows – a rare variety of snow crab, but of course. The coveted crustacean is presented four ways. Meat from the body comes served on a deep fried piece of turnip, teasing out the salty flavour of the flesh. There’s fine roe in a shell, the small species offering a surprising punch and one of the richest flavours of crab we’ve ever tasted. Leg meat in ginger serves as a palate cleanser before we embark on this course’s pièce de résistance, a miso crab jelly that’s made with broth from the shell. We find ourselves experiencing every single taste crab can offer in a few small bites. The last dish before our fruit and yoghurt dessert is a seemingly straightforward course consisting of crispy rice served in broth peppered with crispy rice and shiso leaves. Naturally, the taste is anything but simple. Strangely, we’re given chopsticks with which to eat the soupy offering. With so much attention to detail elsewhere, we can’t believe this is an oversight, though it leaves us feeling somewhat inadequate as we try to grasp each disparate grain. Regardless of our crude eating skills, it’s not a bum note to end on. The vivid, fresh aromas of the shiso promise spring, imbuing us with a longing to return when Kashiwaya changes the menu next season. Apart from the frustrating utensil choice near the end of the meal, everything is perfectly exquisite at Kashiwaya. The prestigious ingredients, sublime preparation and incredible plating provide a gastronomical experience that’s almost poetic. You pay heavily, but it’s worth every cent.